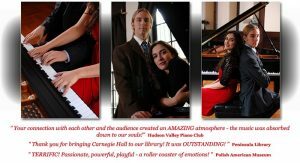 The duo piano recital engages the audience in conversation about the musical pieces with descriptions, explanations and demonstrations of the music, as well as historical and cultural facts that further heighten this unique musical experience. Ossie Davis Theater. Suggested donation: $2.00. Made possible by the Friends of the New Rochelle Public Library.